Man’s evolution is from innocence to innocence. The first innocence is ignorant, the second innocence is luminous. The first innocence is a kind of sleep; the second innocence is an awakening. The first innocence is a gift of God, the second innocence is man’s own effort, his earning, his work upon himself. The first can be lost, the second cannot be lost. The first has to go – in the very nature of it, it cannot be eternal; but the second, once it comes, remains forever – it is eternal. Remember, whatsoever you attain consciously, only that can you possess, ONLY that. Whatsoever is given to you, and you receive it unconsciously, will be taken away. Only that really happens to you for which you work hard. Only that belongs to you which you create in your being. You become Master of it. The first innocence in Christian terms is called Adam. And the second innocence is called Christ. And Jesus is just in-between the two. Jesus is the bridge between the first innocence and the second innocence. Hindus call the second innocence ’rebirth’: one becomes twice-born, DWIJA. And that’s what Jesus also said to one of the famous professors and theologians of his time, Nicodemus: Unless you are born again, you will not attain to the kingdom of God. The first birth has happened; the second birth has to happen. The first has happened without cooperation, the second cannot happen without your cooperation. The first birth was almost like an accident – it happened to you unawares. The second birth can only be in immense consciousness; it cannot happen unawares, it can happen only in deep meditation. Jesus is a bridge between Adam and Christ. That’s why the story of virgin birth has a metaphoric meaning. Jesus is born innocent. Everybody is born innocent – there is no other way to be born. Every child is born in innocence. But then that innocence is lost sooner or later, and the more intelligent the child, the sooner it will be lost. If the child is stupid, imbecilic, idiotic, then it may go on lingering for a long time; it may not be lost. If you are intelligent, you will start moving away from it. You will start exploring the world. You will start adventuring into the world, into the unknown; you will become a wanderer. And the more intelligent you are, the more is the possibility that you will not follow the crowd, you will find your own way – you would like to do your ‘own thing’. You will not move on the superhighway, you will move on small footpaths into the jungle; because intelligence wants to take risks. Intelligence wants to dare, intelligence wants to go into the unknown and the dangerous, because it is only in danger that intelligence comes to its peak. It is only when you dare that your intelligence becomes a crystallization. It is only when you risk that you are. The more you risk, the more you are. Risk brings being. A man who never risks remains without a being. George Gurdjieff used to say that not everybody has got a soul. Because you have never dared, how can you get a soul? The soul comes only through daring. The only right way to attain a soul is to go into dangers, to risk all, to be a gambler, to go into the dark unknown. The first innocence is going to go, has to go. And it is good that it goes. If it continues, you will not really be a man; you will be a vegetable or a cow or a buffalo, but you will not be a man. That is where man is different from the whole of nature. Nature lives in the first innocence; only man is capable of losing it. It is great dignity, it is glory – only man is capable of sin, no other animal can commit sin. You cannot call a dog a sinner, you cannot call a lion a sinner and you cannot call a tree a sinner. Only man can sin, and because man can sin, only man can go beyond sin. Only man can go astray – that means only man can come back home. Except for man, all the animals, birds and trees still exist in the Garden of Eden – they never left it. That’s why nature has such beauty, such peace, such silence. The Himalayas still exist in the Garden of Eden. So exists the rose bush of your garden, so exist the birds that come in the morning and sing songs around you. Nature is still there; it never left home, it never went astray, it never committed anything against God, it never disobeyed. It never dared; it is completely satisfied with the first birth. To be satisfied with the first birth is to remain unconscious. It is only through sin that you become conscious. It is only by going wrong that consciousness arises. This HAS to be understood. So going wrong is not really going wrong, because only through it does the consciousness arise. All has to be lost. One has to come to the point where all is lost, God is lost, heaven is lost – one cannot believe in paradise, and one cannot believe that innocence is possible. Only from that peak of frustration, anguish, anxiety is there a possibility of a one-hundred-and-eighty degree turn. Adam is perfectly at ease, so is Christ. The problem is with Jesus. Jesus is troubled. Zen people are right when they say for a man who has never heard of meditation; mountains are mountains and rivers are rivers. He is happy; he is in a kind of natural state. He has no anxiety, because God has not yet become a challenge to him. He has no future goals, he has no destination. He eats drinks and is happy – the first hedonism I was talking about the other day: ‘Eat, drink and be merry.’ He lives in the body, he IS the body; he knows nothing more than that. With the body there is a kind of peace and health that surrounds him. You can always see that happiness around a child. The child is the first kind of hedonist. He believes only in eating, drinking and being merry. He simply lives the moment. He is completely abandoned in the moment – no anxiety, no clouds yet – his sky is clear. The people who have not heard of meditation and enlightenment and Nirvana and God, who have never pondered over these great problems – for them things are clean; they are not confused. ‘Mountains are mountains and rivers are rivers.’ But once a man has become interested in meditation, in growth, in spirituality, in the other shore, in the other reality – problems bubble up in thousands, problems crowd. Mountains are no more mountains now, and rivers are no more rivers; everything becomes confused, everything becomes topsy-turvy. Man goes into a chaos. The old cosmos, the old innocence, simply falls into pieces; not even a trace is left. This is the meaning of the Christian parable of Adam’s expulsion from the Garden of Eden. He became interested in higher things; he became interested in knowing things. He ate the fruit of the Tree of Knowledge, he started becoming more conscious. He started trying to understand what this reality is. He moves into knowing, and suddenly the doors of the Garden are closed for him. Suddenly he finds himself outside the Garden, and he does not know where the way back is. He has to go farther and farther away. This is what Zen people say: Mountains are no more mountains, rivers are no more rivers. Then one has to go on a long journey. Tedious is the journey, full of miseries and nightmares. It is a wandering in a desert where oases are only dreams; they exist not. And then after a long, long journey – it may continue for many, many lives – one can come back. This time, coming back has a totally different meaning. Now one comes as a knowing consciousness. One is again innocent, but this innocence is no more ignorant, it is luminous, it is full of light. This is Jesus turning into Christ. Adam finds himself outside the Garden. Jesus wanders in the world. Christ suddenly finds himself back in the Garden one day. Adam, Jesus, and Christ – these are the three stages of human consciousness. Adam is absolutely unconscious. Jesus is half-conscious, half-unconscious – hence the conflict, the confusion, the division, the tension. And Christ is absolute consciousness. OSHO ~ WHERE IS HAPPINESS? 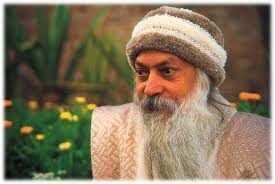 The Invitation from Osho in celebration of his day of birth.